Are you ready to travel on a path of playful self-discovery and reconnect with the passionate, vibrant woman inside you? Is your unique voice – the one you were born with – yearning to express itself with complete freedom? If, so, then know this: You deserve unabashed happiness. You deserve to courageously follow your dreams. I will help you remember your true creative nature and guide you to fully embrace a rich, expressive, spontaneous life. The one you deeply desire to have. Loving it? Click HERE to download and print my “Fulfilling Life Manifesto”, so you can hang it as a reminder to live each day to the fullest. Receive my free Museletters in your inbox, full of inspiration and practical tips to keeping on track with this scary journey of reclaiming yourself and your creativity. You’ll also get VIP access to my new goodies, freebies, special offers, and more! Enter in your name and email below to sign up. If you’d like to connect with me or other “travelers” on a similar journey, or would like to take a peek “behind the scenes”, join me over on Facebook by clicking ‘Like’ in the box below. Here, I like to engage in chit-chat and share updates on my own self-reclaiming journey, as well as relevant and inspiring articles, with the occasional inspirational photo. Please Note: Due to Facebook’s algorithm, there’s a chance that you won’t see any of my posts even if you do “like” my page. The best way to stay updated with my blog, offerings, and more is to sign up for my e-letter above. If you’d like to get notified via facebook when I share something there, be sure to visit my Facebook page directly, hover over the “Like” button, and then click on “Get Notifications”. 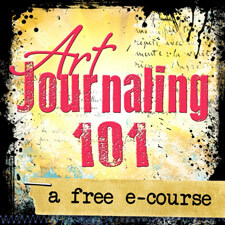 I’ve designed Art Journaling 101 to gently introduce beginners to art journaling so you can find your way with more ease and less fear. We dive into the basics such as choosing a journal, supplies, beginner’s techniques, and more. As well as talk about the obstacles you may encounter such as finding time to journal, and overcoming the fear of the blank page. Whether you call it your inner critic, self-doubt, or you just being plain hard on yourself – we all have a voice within that often derails us from our dreams or squashes our creative interests. Instead of endlessly fighting it back, I can guide you in healing your relationship with this inner voice and reconnecting with your inner wisdom – that other little voice within that knows exactly what your truth is. Time to Get Real – What’s Stopping You?